nextt week, when V.I.P.s and special guests shuffle through Christie’s new West Galleries, in Rockefeller Center, they will alight on a series of abstract paintings by a group of relatively unknown artists. These pieces reflect a recent market craze for attractive, anodyne work with an emphasis on process and materials. But the artists at the West Galleries are not young painters from Brooklyn, Berlin, or Los Angeles. They are a group of Korean octogenarians who comprise a movement known as Tansaekhwa (or “Dansaekhwa”) and have been producing in this style since the nineteen-seventies. Although he was the dean at Korea’s most prestigious art school, Hongik University, for many years, Park Seo-Bo, who is eighty-four, had a negligible market as well. 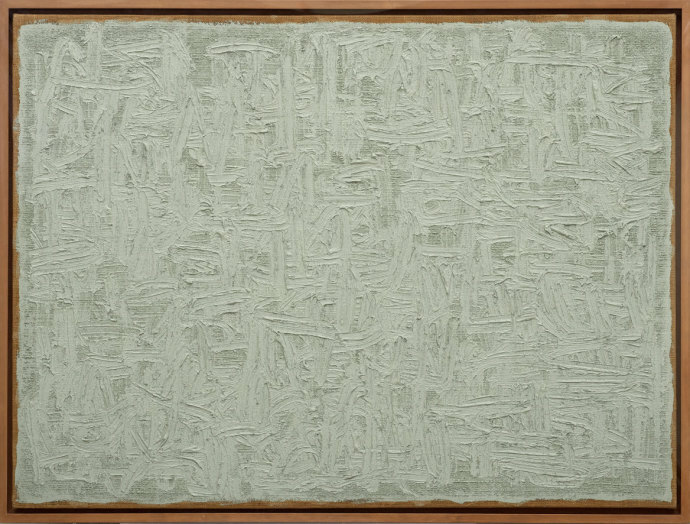 Park’s 1982 piece “Ecriture 3-82” was sold in November, 2013, for $56,750 and then resold in May of this year for $631,972. In the nineteen-eighties, Park said, he couldn’t sell this kind of work for even three million Korean won, which, at the time, was equivalent to less than four thousand dollars. The powerful art adviser Allan Schwartzman, who has taken a keen interest in Tansaekhwa, said, “I’ve never seen this amount of widening interest in a particular circle of non-contemporary artists, in historical material before.” The number of upcoming exhibitions associated with the group this fall supports Schwartzman’s observation. In New York alone, the blue-chip galleries Blum & Poe, Galerie Perrotin, and Tina Kim will open shows of Yun Hyong-Keun, Chung Chang-Sup, and Ha Chong-Hyun respectively, within a week of each other, starting on October 30th. In London during Frieze week, in mid-October, no fewer than three exhibitors—Axel Vervoordt, Kukje Gallery / Tina Kim, and Hakgojae—will be showing Tansaekhwa works at Frieze Masters. South of the fair, in a tony gallery space next to the Royal Academy of Art, the global mega gallery Pace will host a retrospective of Lee Ufan’s paintings from the Tansaekhwa period. What started the market phenomenon? It can be traced to two shows of major historical works: one, at Kukje Gallery in Seoul, in August, 2014, and, less than a month later, a show at Blum & Poe in Los Angeles, which was curated by Joan Kee, an art historian who authored “Contemporary Korean Art: Tansaekhwa and the Urgency of Method,” the first book on the movement in English. (The artists credit her for spurring international interest in their work.) Following the two exhibitions, a number of institutions acquired Tansaekhwa works, including the Art Institute of Chicago; the Centre Pompidou, in Paris; the Guggenheim Museum in New York and Abu Dhabi; the Hirshhorn Museum, in Washington, D.C.; the Museum of Modern Art, in New York; and M+, a new museum currently under construction in Hong Kong. Important American collectors, such as Howard Rachofsky, who, with his wife, Cindy, has promised their entire collection to the Dallas Museum of Art, also bought from these shows, under Schwartzman’s guidance. As collectors took their cue from these influential tastemakers, auction prices went up. Since the Blum & Poe and Kukje shows last year, seventy-two works by Chung Sang-Hwa, Park Seo-Bo, Ha Chong-Hyun, and Yun Hyong-Keun have sold for more than a hundred thousand dollars each at auction. Prior to that, only four works had surpassed a hundred thousand dollars, ever. Although the sales took place in Asia, more than half of the bidders were Western collectors and new clients, Jihyun Lee, a specialist at K Auction, which holds auctions in Korea and Hong Kong, said. Seoul-based Yunah Jung, who is organizing the Christie’s selling exhibition, concurs that Western interest is driving the market. Joan Kee, the art historian, says that Tansaekhwa has that “extra oomph factor” from its association to Lee Ufan, who was acclaimed in the late nineteen-sixties as the main theorist behind the Japanese postwar movement Mono-Ha. But she cautions that Tansaekhwa was not an official movement; there was no manifesto, nor a clearly defined group of members. The term, meaning, literally, “monochrome painting,” appeared in the mid-nineteen-seventies to describe work that shared a spare palette and an innovative approach to process, which differed from artist to artist. Lee Ufan created works consisting of lines, made by dragging his brush down the length of the canvas until the pigment disappeared, and points, made by repeatedly pressing the tip of the brush against the canvas until the paint was used up. Park Seo-Bo used pencil to draw dense scribbles, wispy lines, and sinuous loops into the still-wet surface of the painted canvas. Chung Sang-Hwa covered the canvas in a layer of zinc-based paint, laboriously stripped away sections and then repainted those areas with a slightly glossier acrylic paint. Ha Chong-Hyun used a burlap woven fabric as a support and pushed paint from the reverse side, allowing it to seep through to the front. Works from Lee Ufan’s “From Point” series, currently on view at Pace London. The artists’ choice of materials also reflected these conditions. Ha Chong-Hyun began using burlap, a material sent by the U.S. to aid South Korea and which was readily and cheaply available at Seoul’s Namdaemun Market. Specific to the Korean context yet resonant with Western abstraction, Tansaekhwa came to dominate international shows of Korean contemporary art by the late nineteen-seventies. Over time, the movement gradually fell out of favor; only its most celebrated artist, Lee Ufan, who mainly split his time between Tokyo and Paris, maintained a successful career both at home and abroad. The response to the Kukje and Blum & Poe shows was immediate, but not entirely surprising given that it came soon after a market boom for Gutai, another rediscovered movement that was both non-Western and abstract. Founded in Japan in 1954, Gutai challenged the conventions of art in an astounding array of mediums, including painting, performance, installation, and participatory art. In recent years, the market has taken particular interest in one member, Kazuo Shiraga, who created violently expressive works by painting with his feet. Since 2009, the average price of Shiraga’s work has risen more than sixfold. This spring, the market reached a fever pitch when two of New York’s most important galleries—Dominique Lévy and Mnuchin Gallery—mounted Shiraga shows concurrently and a third gallery, Fergus McCaffrey, which has represented the Shiraga family since 2009, held a show shortly thereafter. Tansaekhwa has several advantages over Gutai, including abundance. According to Schwartzman, who has acquired, with his clients, works by Gutai and Tansaekhwa artists, “there was never meaningful supply of Gutai.” The supply that did exist was widely dispersed. Shiraga, for instance, was represented for decades by galleries in Paris, Berlin, and London, so many of his works ended up in European collections. Because most of the Tansaekhwa artists had few market outlets prior to 2014, most of them are sitting on vast resources of material. Ha Chong-Hyun estimates that he still possesses roughly a thousand works, though he has promised a portion to a municipal museum in Korea. Dealers are prepared. “We’re committed to push it to another level,” Tina Kim, one of the New York gallerists, said. 2016 promises a fresh crop of Tansaekhwa exhibitions. The global juggernaut White Cube, known for its longtime representation of Damien Hirst and his Y.B.A. cohorts, will open the year with a solo show of Park Seo-Bo in London in January. Blum & Poe has three shows in the works, notably a group show in L.A. juxtaposing Tansaekhwa artists with western counterparts such as Brice Marden and Robert Ryman which will make an emphatic case for Tansaekhwa in the postwar art-historical canon. Dominique Lévy, whose show of Shiraga was integral in catapulting him to mainstream prominence, is organizing a joint show of Chung Sang-Hwa with the Chelsea gallery Greene Naftali. There may indeed be room yet for more growth. Tina Kim recalled a recent meeting with a Chinese collector who was suspicious of these relatively low price levels. “Why is it so cheap? Why is it not half a million?” the collector asked, wondering if there was something wrong with the work. 2015년 10월에는 현재 주목 받고 있는 아시아 작가들의 추상회화를 보기 위해 미술계 특급 VIP들이 뉴욕 록펠러센터의 크리스티 갤러리로 총출동할 예정이다. 이 특별한 전시에 참여하는 작가들은 80세를 훌쩍 넘긴 원로 작가들로서 70년대 한국의 단색화 운동을 이끈 주역들로 현재까지도 왕성하게 작품활동 중이다. 한국의 단색화는 뉴욕과 홍콩에서 이미 여러 전시를 통해 그 저력을 입증하며 미술계로부터 뜨거운 관심을 받고 있다. 뿐만 아니라 그 명성에 따른 작품가격 또한 여러 차례 회자된 바 있다. 그 예로 박서보 작가의 작품은 한 점당 대략 100만달러 선에서 거래가 오가고 있으며, 정상화의 작품은 한 점당 150만달러를 웃돈다. 이는 작품 가의 거품이 워낙 유동적인 아트마켓의 현상을 감안하면 어마어마한 가격이라 말할 수 없을지라도 동시대 미술 특히 한국 미술에서도 지나간 기성세대 작가의 재도약이라는 점을 고려한다면 단색화 현상은 가히 엄청나다고 할 수 있다. 작가 하종현의 경우는 지난 40년간 한국과 일본을 기반으로 활동을 하였지만 지난 1년간의 활약을 비교해보자면 이는 실로 급격한 변화임을 주목하지 않을 수 없다. 지난해 12월 뉴욕에서의 첫 개인전을 비롯하여 뉴욕현대미술관(MoMA)에 작품이 소장되는 영광을 누렸고, 금년 베니스비엔날레에서 열린 단색화전시에 병행 전시로 초대되어 대형 단색화 전시를 성공적으로 개최한바 있다. 지금까지 약 45점에 이르는 그의 작품이 메이저 옥션에 출품되었고, 그 중 9점이 10만달러 이상의 가격에 판매되었다. 그의 작품은 2013년 1만 3천달러 선에 대략 5년간 (2007년부터 2013년까지) 옥션 기록에 따라 여덟 작품이 옥션에 출품 그 중 절반 정도가 낙찰된바 있다. 하종현에 따르면 “당시 한국에서 이런 스타일의 작품은 상업적인 주목을 받기 힘들었다” 고 소회하며 당시의 어려웠던 시간을 회상하였다. 뿐만 아니라 한국의 저명한 예술대학인 홍익대학교 미술대학장을 역임한 박서보 작가 또한 한동안 명성에 비해 높지 않은 작품 가를 유지했었지만 2013년 11월에 5만 7천달러에 낙찰된 1982년작 <묘법 3-82>는 올해 5월 64만달러에 재판매 되었다. 작가에 따르면 같은 시리즈의 작품이 80년 당시에는 시가로 4천원(현 화폐가치로는 3백만원)에도 판매되기 어려웠다고 전했다. 이렇듯 이번 단색화에 대한 집중과 관심은 세계 미술시장의 변화에 상응하는 결과라고 할 수 있다. 그 예로 2011년 뉴욕 구겐하임미술관의 이우환 회고전을 기획한 알렉산더 먼로 수석 큐레이터는 이 같은 단색화 열풍은 이미 예견된 당연한 결과라 언급했다. 그 외 저명한 아트 어드바이저인 앨런 슈바르츠만은 “비교적 동시대의 범주에서 벗어난 작가군에 속하는 원로작가들의 특정한 미술사조가 이렇게 큰 관심을 받는 것은 전무후무한 일”이라고 밝혔다. 금년 후반기에 예정된 단색화 관련 전시들은 그의 주장을 뒷받침 해준다고 볼 수 있다. 뉴욕의 블루칩갤러리인 티나킴갤러리, 블럼앤포, 페로탱에서만 하종현, 정창섭, 윤형근의 개인전이 1주일 간격으로 연달아 개막 예정이다. 이달 10월 중순에 열리는 런던의 프리즈 아트페어의 프리즈 마스터즈 섹션에서는 국제갤러리/티나킴, 악셀 베르보르트, 학고재갤러리에서 단색화 작품으로 부스를 소개할 예정이다. 나아가 초대형 갤러리라 할 수 있는 페이스에서는 영국 왕립예술학교 옆에 위치한 전시장에서 이우환의 단색화 시대 회화작품들로 전시를 준비하고 있다. 이러한 단색화 열풍은 2014년 8월에 서울의 국제갤러리와 한달 간격으로 LA의 블럼앤포에서 각각 열린 단색화 전시를 통해 시작되었다고 해도 과언이 아니다. 특히 블럼앤포의 전시는 미술사학자이자 Contemporary Korean Art: Tansaekhwa and the Urgency of Method의 저자인 조앤 기가 기획하여 크게 주목 받았다. 이 책은 단색화 운동을 조명한 첫 영문서적으로써 이 책을 통해 단색화에 대한 국제적 관심이 촉발되었다고 참여작가들은 입을 모은다. 앞의 두 전시에 힘입어 시카고 현대미술관, 파리 퐁피두센터, 뉴욕과 아부다비의 구겐하임미술관, 워싱턴의 허쉬혼미술관, 뉴욕현대미술관(MoMA), 홍콩의 M+미술관 등 세계 유수의 미술기관에 단색화가 소장되었다. 세계적으로 명망 있는 콜렉터인 하워드 라초프스키와 그의 아내 신디 라초프스키는 그들의 모든 소장품을 추후 텍사스 달라스미술관에 기부하겠다고 선언하여 주목을 받았는데, 이들 또한 최근 단색화 작품들을 구매한 것으로 알려졌다. 영향력 있는 컬렉터들의 구매 소식은 개인 컬렉터들에게 향후 미술시장에 대한 중요한 지표가 되기 때문에 이들의 움직임에 따라 옥션 가격은 영향을 받는다고 볼 수 있다. 작년 국제갤러리와 블럼앤 포 전시 이후로 72점에 이르는 정상화, 박서보, 하종현, 윤형근 작품들은 현재 수 십만달러 이상을 육박한다. 이는 과거 대략 4여점의 단색화 작품이 10만달러를 넘긴 것과 비교하면 괄목할 만한 성장이다. 특히 이지현 K옥션 관계자는 한국과 홍콩에서 옥션을 진행하면서 절반이 넘는 낙찰자들이 해외 컬렉터들이었다는 점이 눈에 띈다고 전했다. 국제갤러리와 블럼앤포 전시에 대한 시장의 반응은 즉각적이었지만 이미 일본의 구타이 작품들이 한 차례 붐을 일으키며 시장을 형성해 놓았기 때문에 단색화의 시장진입이 한결 수월할 수 있었다. 단색화는 구타이에 비교하여 여러 가지 면에서 우위를 차지한다고 볼 수 있는데 첫째로 공급의 문제를 들 수 있다. 구타이 작가들의 작품들은 이미 세계 여러 나라 컬렉터들에 의해 광범위하게 흩어져 있기 때문에 새로운 공급이 현저하게 부족한 것이 현실이다. 카즈오 시라가는 파리, 베를린, 런던에 걸쳐 왕성한 작품활동을 하였고 대다수의 작품들은 현재 유럽 컬렉터들에게 소장되어 있다. 하지만 단색화 작가들은 2014년 전까지는 해외에 소개된 기회가 드물었기에 작가 스스로가 대부분의 작품을 보관하고 있다. 하종현은 지방의 지자체 미술관에 기부할 작품들을 포함 대략 1천여 점의 작품들을 직접 소유하고 있다고 밝혔다. 이렇듯 단색화가 지닌 역사적 의미와 더불어 대부분의 작가들이 적지 않은 나이에도 불구하고 현재까지도 활발한 작품활동을 지속하고 있다는 점은 단색화가 앞으로도 시장에서의 우위를 차지하는데 커다란 강점으로 작용할 것이다. 뿐만 아니라 그들의 작품세계가 판매에 최적화된 회화 위주로 형성되어 있다는 점도 간과할 수 없는 부분이다. 단색화가 서양의 회화와 구분되는 점은 작품이 아직까지 비교적 합리적인 가격에 거래되고 있다는 것이다. 한 큐레이터는 현재 실정으로는 “1천 1백만달러로 라이먼의 작품 한 점 밖에 살 수 없지만 단색화는 전 역사를 통채로 살 수 있다” 라고 부연한다. 2014년 단색조의 추상회화 시장은 절정에 이르렀다. 데이비드 오스트로우스키나 루시엔 스미스와 같은 젊은 작가들의 작품은 1-2 년도 채 안 된 작품들이 수 십만달러에 팔려 나간바 있다. 한 컬렉터는 이 같은 현상을 두고 “보기에 편한 작품들이 구매욕을 일으키는 것은 사실이지만 미술사학적 가치를 평가하기엔 너무 이른 시기이다” 라고 언급했다. 그에 반해 역사적 맥락에서 풀이되는 단색화의 정신적 배경은 그 가치가 어마어마하다. 이지현 K옥션 관계자는 “서양의 컬렉터들은 단색화의 추상적 표현이 그들에게 다소 친근한 지점이 있기 때문에 문화사회적 배경에 대한 충분한 이해 없이도 작품을 감상할 수 있다는 점이 큰 매력으로 다가간다”고 덧붙여 말했다. 지난 해 국제갤러리와 블럼앤포 전시 이후로 급성장한 시장을 반영하듯이 이번 크리스티 전시에 나오는 단색화 작품들은 모두 가격이 4배씩이나 증가하였다. 현재로서는 이러한 단색화 열풍이 단순히 거품에 그칠지는 아직 미지수이다. 유수의 기관들로부터 구매가 이어지고 있다고는 하지만 아직까지 대형미술관에서 단색화를 조망하는 전시는 열리지 않았고, 작품 가격들은 나날이 증가하고 있기 때문에 미술관들의 구매가 지속될지는 더 지켜봐야 한다는 의견도 나온다. 이에 대해 뉴욕의 티나킴갤러리 대표는 강한 자신감을 내비쳤다. 2016년에도 단색화에 대한 열기는 식지 않을 예정이다. 데미안 허스트와 영국 YBA의 전시로 알려진 세계적 갤러리 화이트 큐브에서는 내년 1월 런던에서 박서보 작가의 개인전을 개최할 예정에 있다. 블럼앤포는 LA에서 단색화 작가들와 함께 브라이스 말든, 로버트 라이먼과 같은 서구 추상회화 작가들과 그룹전을 개최 예정이며 전후 미술사에서 단색화를 재조명할 수 있는 세 개의 전시를 준비 중이다. 이외에도 카즈오 시라가를 주류 작가로 탈바꿈 시킨 유명 갤러리 도미니크 레비와 뉴욕 첼시의 그린 나프탈리 갤러리는 조만간 정상화 개인전을 선보일 예정이다. 때문에 단색화의 전망은 매우 밝다고 할 수 있다. 티나 킴에 의하면 최근 한 중국 컬렉터는 단색화의 낮은 작품가를 듣고는 믿기 힘들어 하며 강한 의구심을 보였다는 후문이다.